Special report to be included in Science in Society #55 (available August 2012). 14’000 Americans already died from Fukushima fallout? A paper published online December 2011 in a peer-reviewed journal estimated that nearly 14’000 have died in the United States in 14 weeks following the arrival of the radioactive fallout from the Fukushima meltdown [Mangano JJ and Sherman JD. An unexpected mortality increase in the United States follows arrival of the radioactive plume from Fukushima: Is there a correlation? Internation Journal of Health Services 2012, 42, 47-64]. 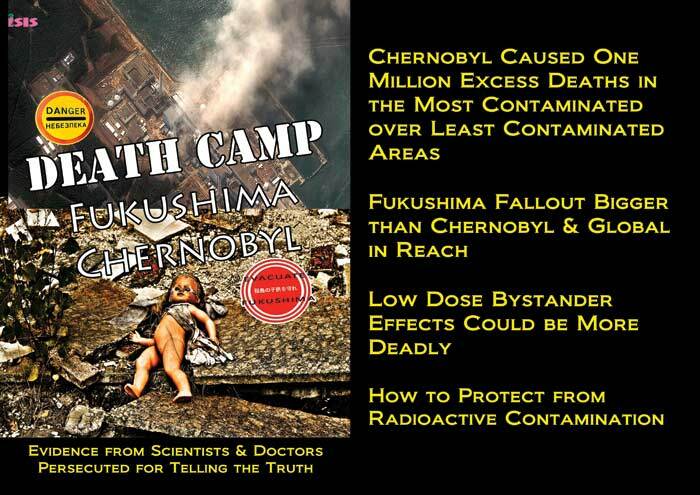 It noted that the estimate is comparable to the 16’500 excess deaths in the 17 weeks after the Chernobyl disaster. The rise in reported deaths after Fukushima was greatest among infants less than one year of age. The authors’ credentials appeared impeccable [“Study: Fukushima radiation has already killed 14,000 Americans”, WashingtonsBlog, 24 December 2011]. Joseph Mangano is a public health administrator and researcher who studies low-dose radiation exposure and subsequent risk of diseases such as cancer and damage to the newborn. He has published numerous articles and letters in medical and other journals as well as books, including Low Level Radiation and Immune system Disorders: an Atomic Era Legacy. Janette Sherman worked for the Atomic Energy Commission (precursor of the Nuclear Regulatory Commission) at University of California Berkeley, and for the US Navy Radiation Defense Laboratory in San Francisco. She specializes in internal medicine and toxicology, with an emphasis on chemicals and nuclear radiation, was an advisor to the National Cancer Institute, and served on the advisory board of the Environment Protection Agency for 6 years. A major criticism of their work is that the authors claimed Fukushima fallout arrived just six days after the earthquake, tsunami, and meltdowns, but they provided no evidence for this assertion [“Researchers trumpet another flawed Fukushima death study”, Micheal Moyer, Scientific American, 20 December 2011]. Another is the paucity of radioactive measurement data; but that is the responsibility of the US Environment Protection Agency (EPA), and is hardly the authors’ fault. Indeed, the authors are themselves critical : “The paucity of data from the U.S. EPA is unfortunate and will hamper future studies.” The same paucity of data has indeed hampered studies that might have prevented the humanitarian health disaster still unfolding more than 25 years after the Chernobyl disaster (see [Stohl A, Seibert P, Wotawa G, Arnold D, Burkhart JF, Eckhardt S, Tapia C, Varga and Yasunari TJ. Xenon-133 and caesium-137 releases into the atmosphere from the Fukushima Dai-ichi nuclear power plant: determination of the source term, atmospheric dispersion, and deposition. Atmos Chem Phy 2012, 12, 2313-43. Led by A. Stohl at Norwegian Institute for Air Research, Kjeller] Chernobyl Deaths Top a Million Based on Real Evidence, SiS 55). Withholding data, or not bothering collecting appropriate data, appear endemic to the nuclear industry and governments in general; and Fukushima is no exception ([Ho MW. Truth about Fukushima. Science in Society 55 (to appear) 2012] Truth about Fukushima, SiS 55). But a surprising source of observations is coming from radioactivity measuring stations set up under the Comprehensive Test Ban Treaty (CTBT), which foresees a global ban of all nuclear explosions. To verify compliance with the Treaty, a global monitoring system is being built, which includes measurements of radionuclides. Measurements of atmospheric concentrations of both Xe-133 and Cs-137 were available from CTBT stations to a high degree of sensitivity. Sixty monitoring stations are currently delivering data on Cs-137, and 25 stations delivering data on Xe-133 to the International Data Centre of the Preparatory Commission for the CTBT Organisation in Vienna. Cs-137, with a half-life of 30.17 years, comprises approximately half of the total radioactive caesium released, the other half being Cs-134 [Assessment on the 66th day of projected external doses for populations living in the north-west fallout zone of the Fukushima nuclear accident, outcome of population evacuation measures, Report DRPH/2011-10, Directorate of Radiological Protection and Human Health, Institut de Radioprotection et de Sûreté Nucléaire, October 2011]. Xe-133, with a half-life of 5.25 days is the most abundant Xe isotope, comprising >97.3 % of xenon in emissions. After the earthquake and Tsunami struck, elevated levels of radioactive emissions were measured in Japan and all over the Northern Hemisphere including the CTBT monitoring stations. But the point measurements are too sparse to determine the three-dimensional distribution of radionuclides in the atmosphere and their deposition on land and sea. Given accurate emissions data, dispersion models can simulate the atmospheric distribution and deposition of radionuclides and provide a more complete picture than the measurements alone. The simulations must be compared, and fit the measurement data. However, the single largest source of error in prediction is the source term, the rate of emissions into the atmosphere from the accident site. To this day, the time variation of emissions from Chernobyl is still uncertain. The most comprehensive information on the events in the Fukushima disaster is a report released by the Japanese Government in June 2011 to the International Atomic Energy Agency (IAEA) [Nuclear Emergency Response Headquarters, Government of Japan: Report of the Japanese Government to the IAEA Ministerial Conference on Nuclear Safety – The Accident at TEPCO’s Fukushima Nuclear Power Stations, accessed 7 October 2011], and its subsequent updates. Although the report contains estimates of the amounts of radioactivity released into the atmosphere for certain key radionuclides, the data are not reliable; as the releases did not take place through defined pathways and were not metered. 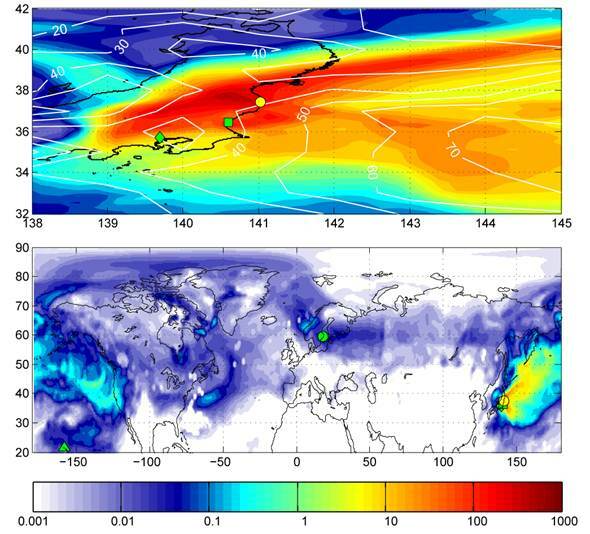 To make the best use of the available information and data, an international team led by Andreas Stohl at the Norwegian Institute for Air Research (NILU) applied state-of-the-art atmospheric dispersion models to optimise the fit between the model calculations (simulations) and the observed measurements, thereby to obtain the most reliable source term. This top-down approach, called inverse modelling, was earlier used to make estimates of the Chernobyl source term. And members of the team have previously developed an inverse modelling method for volcanic eruptions and greenhouse gas emissions. A first guess of release rates were based on fuel inventories and documented accident events at the site based on information provided by the Japanese government’s report. The first guess was subsequently improved by inverse modelling, which combined the results of an atmospheric transport model, FLEXPART, and measurement data from several dozen stations in Japan, North America and other regions. The simulation was driven with three-hourly operational meteorological data from two different sources: The European Centre for Medium-Range Weather Forecasts (ECMWF) analyses, and the National Centers for Environmental Prediction (NCEP) Global Forecast System (GFS) analyses. The results obtained for the total release of Xe-133 was 15.3 EBq (uncertainty range 12.2-18.3, EBq – 1018 Bq), more than 2 × total release from Chernobyl (Chernobyl total was 5.2 EBq) and “likely the largest radioactive noble gas release in history”. This took place between 11 and 15 March 2011. In fact, the release is greater than the entire estimated Xe-133 inventory of the Fukushima Dai-ichi nuclear plant, and is explained by the decay of I-133 (half-life 20.8h) into Xe-133. There is strong evidence that Xe-133 release started before the first active venting was made, possibly from structural damage to reactor components and/or leaks due to excessive pressure inside the reactor. For Cs-137, the inversion modelling results gave a total emission of 36.6 PBq (20.1-53.2, PBq = 1015 Bq); 70 % more than first guess, and about 43 % of estimated Chernobyl emission. The results showed that Cs-137 emission peaked on 14-15 March but were generally high from 12 until 19 March, when they suddenly dropped by orders of magnitude at the time when spraying of water on the spent-fuel pool of unit 4 started. This indicates the emission may not have originated only from the damaged reactor cores, but also from the spent fuel pool of unit 4. Altogether, an estimated 6.4 PBq of Cs-137, or 18 % of the total fallout until 20 April were deposited over Japanese land areas, while most of the rest fell over the North Pacific Ocean. Only 0.7 PBq or 1.9 % of the total fallout was deposited on land areas other than Japan. A scatter plot of all available Xe-137 observations versus simulation results, both a prior (from guess estimate of source) and a posteriori (source values optimised to fit the data) is given in Figure 1. The straight line in the middle is where the correspondence is 1:1 between measured and simulated values, the lines above and below represent respectively overestimates and underestimates by a factor of 5. There is a background emission of Xe-133 from nuclear facilities, which is highly variable, and this is allowed for by adding a value of 1 x 10-4 Bq /m³ to every simulated concentration; consequently, one cannot expect correlation between measured and simulated values at the low end (lower left quadrant). Many of the data points there represent enhanced background observed. Data point in the upper right quadrant all reflect emissions from the Fukushima fallout, and for those data points, the modelled and observed values show a tight correlation, with most simulated points falling within a factor of 5 of the observed values. While the model results using the first guess emissions are already well correlated with the measurements, applying the inversion simulation clearly improves the correspondence, with most of the data points falling closer to the 1:1 line. The scatter plot of the measured and simulated Cs-137 concentrations is given in Figure 2, where again, a background of normally distributed random concentration was added to every simulated concentration value. 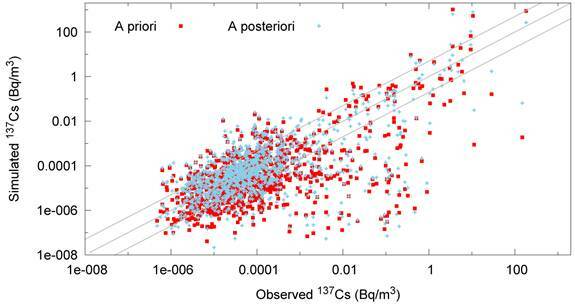 The fit between simulated and observed data are not as good for Cs-137 as it is for Xe-133. One reason is the added complexity of modelling wet and dry removal of the particles carrying Cs-137 from the atmosphere. Nevertheless, there is still a clear correlation between simulated and observed concentrations. Time series of simulated and observed measurements made at key stations in Japan, Oahu (Hawaii), Richland (Washington State), and Stockholm were also produced, as well as the amount of radioactivity deposited on the ground. The fit between simulated and observed tend to be better outside Japan, possibly due to contamination of monitoring stations in Japan. It may have seemed fortunate that westerly winds prevailed during most of the accident to carry the radioactive plume offshore. But exactly during and following the period of the strongest Cs-137 releases on 14 and 15 March, as well as after another period with strong emissions on 19 March, the radioactive plume was carried over Eastern Honshu Island, where rain deposited a large fraction of Cs-137 on the land. Radioactive clouds reached North America on 15 March and Europe on 22 March. By mid-April, Xe-133 was fairly uniformly distributed in the mid-latitudes of the entire Northern Hemisphere and was for the first time also measured in the Southern Hemisphere (Darwin Station, Australia). 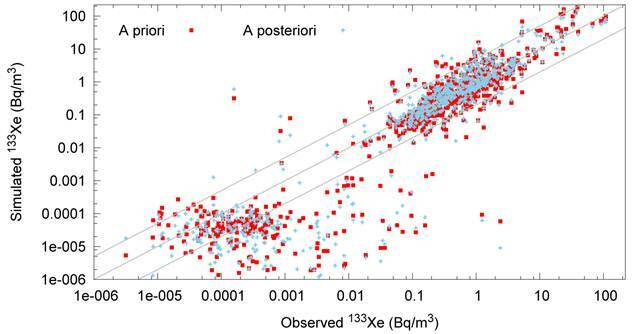 In general, simulated and observed concentrations of Xe-133 and Cs-137 both at Japanese as well as distant sites were in good quantitative agreement. During the accident events, Xe-133 and Cs-137 from the Fukushima fallout dispersed throughout the Northern Hemisphere and eventually also reached the Southern Hemisphere. 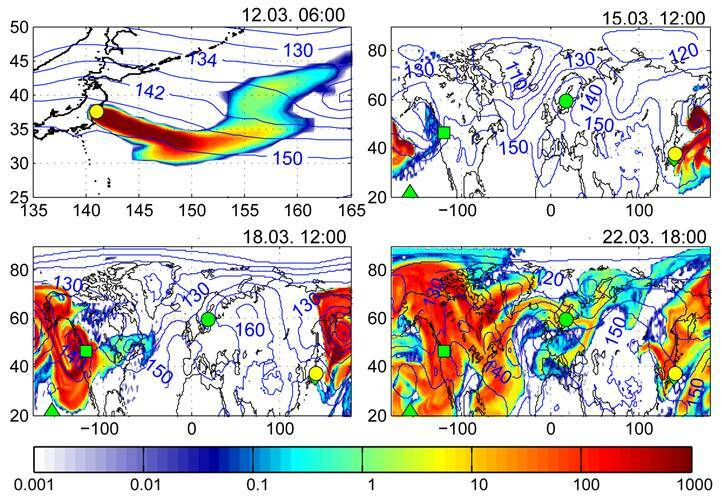 A first radionuclide cloud ahead of the main plume containing only Xe-133 was transported rapidly across the North Pacific at low altitudes and arrived in western North America on 15 March (Figure 3). The first radioactive cloud skimmed along the North American seaboard because a large cyclone over the Eastern Pacific produced a southerly flow along the coastline. It was nevertheless detected at Richland, Washington State in USA. The main part of the radioactive cloud entered western North America on 17-18 March and could be detected by monitoring sites there (see Figure 4). A comparison of the top left panels in Figure 3 and 4 shows that the lead part of the Xe-133 plume is much stronger than the Cs-137 plume, resulting mainly from the earlier start of Xe-133 emissions. On 18 March, high levels of both Xe-133 and Cs-137 can be found over the eastern Pacific Ocean and western North America. This part of the cloud was still close to the surface south of 50º. The high altitude head of the cloud with lower levels of Cs-137 had already arrived over the North Atlantic. At the same time, the radioactive cloud penetrated the subtropics and arrived at Hawaii on 19 March. Figure 3 Simulated total atmospheric columns of Xe-133 (colour shading) in kBq/ m2 and geopotential (height adjusted for pressure, blue isolines) at four different time points from 12 March (upper left) to 22 March 2011 (lower right); Fukushima Dai-ichi Power plant, yellow circle; air sampling site at Tokai-mura, green square; deposition monitoring site in Tokyo, green diamond; air sampling station on Oahu (Hawaii), green triangle; Stockholm, green circle. From the Xe-133 maps (Figure 3), it can be seen that already, by 18 March, the highly radioactive plume had engulfed much of western and central North America from Canada to the USA, with radioactivity ranging well over 1000 to 100’000 Bq or more. Some of this could be easily have been inhaled by the inhabitants. 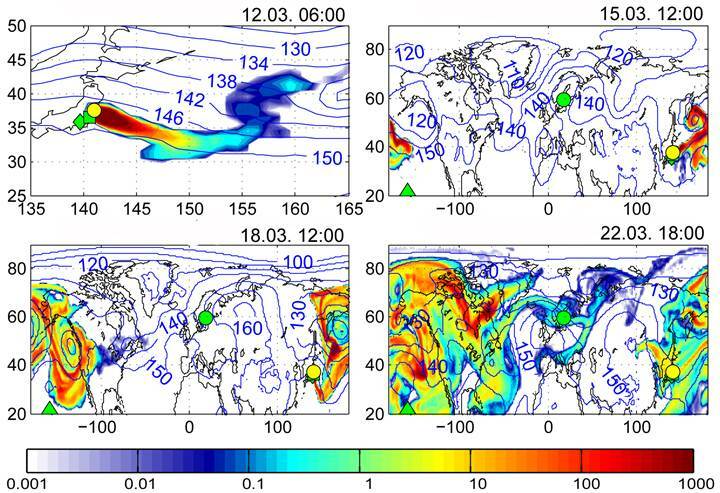 By 22 March, contaminated air from Fukushima had circled the Northern Hemisphere and reached both the tropics as well as the polar regions (Figs. 3 and 4). Even though enhanced surface concentrations were still limited to small parts of the Northern Hemisphere, this changed quickly. In April, all measurement stations recorded an enhanced background of Xe-133. Even the Australian station Darwin started registering enhanced Xe-133 in April. The maps of total deposition of Cs-137 in Japan and globally are shown in Figure 5. Note that the scale is in kBq/m². The orientation of the simulated plume is exactly as found by aerial surveys of Cs-137 between 6 April and 26 May by MEXT. The airborne measurements show that along the main plume axis, Cs-137 deposition values greater than 1000 kBq/m² extends about 50 km from the Fukushima plant (well outside the evacuation zone). In the Chernobyl disaster, Cs-137 deposition values exceeding 1000 kBq/m² were observed in two areas: in the exclusion zone around Chernobyl Nuclear Power Plant and Prypjat, and north of the city of Gomel in Belarus. For the Fukushima accident, the land areas receiving such high deposition values are smaller, but still extensive. In the extratropical North Hemisphere, Cs-137 deposited from past nuclear testing is still present, raising the background to about 1-2 kBq/m². That value is exceeded by deposition from Fukushima over large parts of Honshu Island and the western Pacific Ocean. However, deposition of Cs-137 over other parts of Asia, North America and Europe is minor compared to this pre-existing background. The analysis accounts for more than 90 % of the Cs-137 emissions until 20 April, with the rest still residing in the atmosphere and small amounts lost by radioactive decay. Japan received 6.4 PBq or 18 % of total Cs-137 deposition until 20 April. This is quite similar to a previous estimate of 22 % reported, although their absolute values are smaller because of lower source emissions used. Only 0.7 PBq or 1.9 % of total Cs-137 deposition occurred over land areas other than Japan, while the remaining 80 % (29.28 PBq) were deposited in the oceans. This is in addition to the deliberate releases of radioactivity that constituted “the largest radioactivity releases into the ocean in history”). These results for only two of the main radionuclides already added up to nearly 15 times the total radioactivity in the latest TEPCO estimates [Press release, Tokyo Electric Power Company, 24 May 2012] of just over 1 EBq. If we take the amount of Cs-134 as equal to 36.6 PBq (same as for Cs-137 when measured ), and add the value of 500 PBq for I-131 given by TEPCO for releases into the atmosphere, as well as the rest released into the ocean (18.1 PBq), we arrive at a total of 16.0532 EBq. This is certainly more than the estimated total of 14 EBq released in Chernobyl according to the World Nuclear Association [Chernobyl Accident 1986, World Nuclear Association, April 2012]. The estimates are the best available based on still very incomplete information. In their closing remarks, the authors pointed out that the data collected for the analysis come from various sources, none of which is available to the public . They speculated that more useful data sets were not even accessible to the research team; stating: “Institutions having produced relevant measurement data should make them freely available,” and calling for a central data repository to be created. The analysis has only derived the source terms for two important radionuclides, and work needs to be done on others, notably I-131. This is absolutely necessary to address and mitigate the health impacts of the Fukushima catastrophe already unfolding. The reluctance of officials to disclose information in the early days of the disaster has meant that iodine tablets were not distributed to people in the most highly contaminated areas, with the result that 44.5 % of the children showed radioactive contamination of up to 35 mSv in their thyroid gland; and an examination of more than 38 000 children in Fukushima prefecture found cysts in 35 % of the children’s thyroid gland (see ). The need for systematic monitoring, data-sharing, and research applies across the globe; as the available data already demonstrate, the disease burden will not be restricted to Japan. This entry was posted in Luttes antinucléaires, Luttes pour la terre and tagged Fukushima, Tchernobyl. Bookmark the permalink.